← Is Work Bad For Your Back? Tiger Woods has just pulled out of a golf tournament due to back pain. 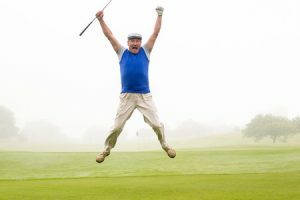 Golfers can be vulnerable to these problems so, whether you are a veteran golfer or new to the sport, Shrewsbury Chiropractic Clinic has some top tips to help golfers attain a pain-free swing. Having just one joint or muscle out of line can make 18 holes seem like 108, which isn’t surprising if you have to swing your club 70-100 times with an injured back or wrist. By simply aligning the body perfectly, everyone can play a better round of golf with less effort and have more fun at the same time. High profile professional golfers can suffer injuries, but the amateur player may be more at risk than Rory, Justin or Tiger! Poor technique, inadequate stretching prior and post-match and incorrectly carrying heavy golf bags are the main causes, but following a few simple tips can solve the problem. – The lower back, shoulders and wrists are the most common areas of risk for golfers through the repetitive nature of the golf swing, but carrying a golf bag can also place an enormous strain on your neck. Take advantage of the latest golf accessories specially designed to help such as lighter bags and dual harness straps over shoulders to ensure weight is distributed evenly. – Golfers often don’t warm up properly before playing – if muscles are not prepared by a good stretching routine, this can lead to a lack of flexibility and injury. Spend two or three minutes warming up before teeing off. Stretch hamstring, quads, chest muscles and shoulders. And don’t forget to warm down after your game, preferably before you reach the 19th! – Drive – make the most of your swing; warm up on the driving range. Do take care on the driving range not to overdo it. Take your time between each shot. – When picking up golf bags, or reaching to pick up the ball, bend carefully from the knees. Don’t bend and twist or over-reach. – Contrary to popular belief, trolleys are not the best way to caddy clubs as this builds unnecessary pressure from pulling and bending in the wrong positions. A power or electric caddy is the safest way to go around. – Wear proper shoes for stability and to help avoid twisting the back and hips. And don’t forget. Any niggles, any pain, or if you haven’t been playing over the Winter due to the grotty weather and your back is a bit stiff, why not come by for a spinal check up here at Shrewsbury Chiropractic Clinic. You never know, it might even improve your game!